Natalie White is a competitive mountain runner. To the uninitiated Natalie runs up and down big mountains! The ones with snow on the top! Now I know some of my friends may not be as enthused by running as I am so I thought I might include another more unusual anecdote to Natalie’s CV – she once chased down a man who head butted a friend of hers in the UK. The poor fool really didn’t know what he had let himself in for as he thought running away would be a good course of action but Natalie chased the man through the town shouting “I’m a British Fell champion don’t you know”. He eventually gave up exhausted and was handed over to the police. Food for thought for Natalie’s competitors, if you look over your shoulder to see Natalie White close to you in a race – you better have something left! 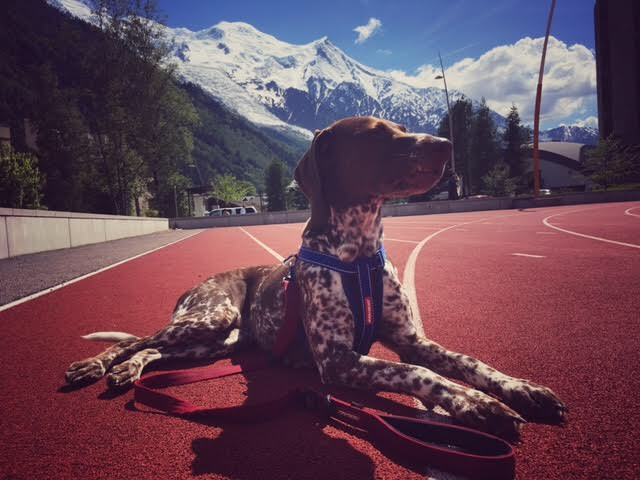 For those of you who follow Natalie http://natsmountain.weebly.com/coaching.html or https://twitter.com/natsmountain you may have noticed her accompanied by her dog Rosa! Rosa is actually the real star of this week’s blog to be honest I wasn’t sure how Natalie might react to being overshadowed by her four legged friend! She apparently has got used to it and judging by how comfortable she is at the track I can see why! So here is a little bit of information on the superstar that is Rosa the Super hound! 1. Could you tell us what age Rosa is and what breed she is? 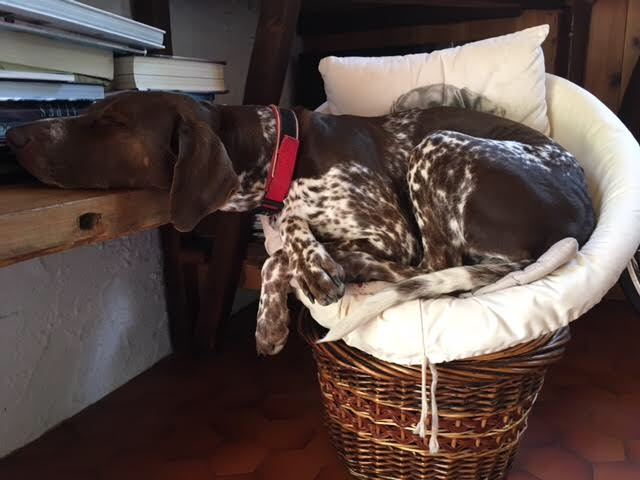 Rosa is a German Shorthaired Pointer who is 8yrs old. I went to see Rosa’s breeder to choose a puppy. I saw Rosa when she was a few weeks old, blind and deaf is how they’re born. She was a cheeky one so wanted to choose her. I went to visit her every week until I could take her home at 8 weeks! 3. Were you a previous dog owner back in the U.K.? 4. Has Rosa changed you in anyway? She’s a super hound and is a really good training companion. 5. Was she difficult to train? 6. 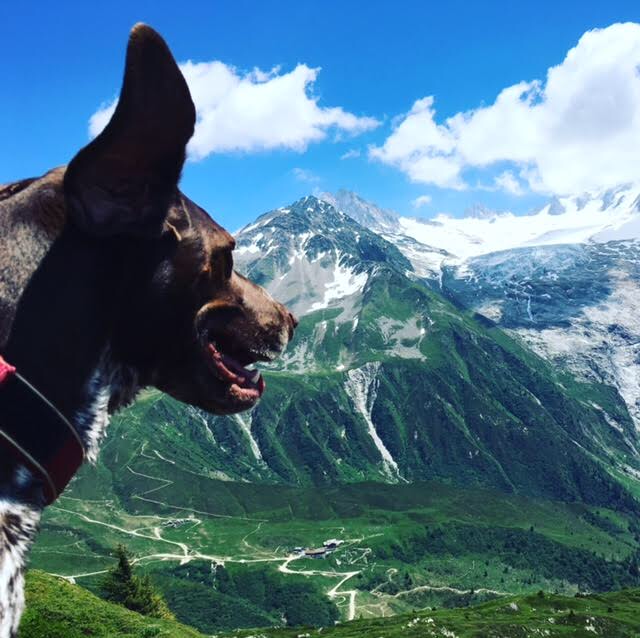 Are there any challenges to owning a dog like Rosa? 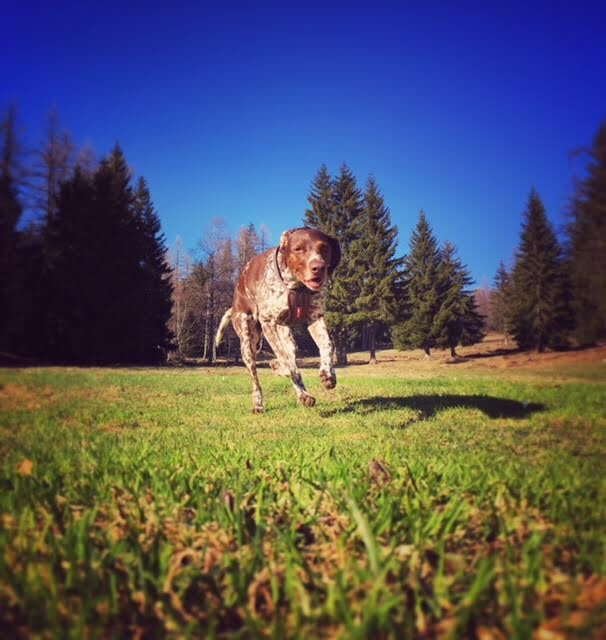 Rosa’s breed GSP’s have so much energy. They need lots of exercise to tire them out. They do say that mental games for them will tire them out more than physical exercise. 7. Do you run together all the time? How many miles would Rosa run in a week? We did attach a special dog GPS on to her collar once but when she runs off in to the woods it looses signal so doesn’t work great. 8. When you are training for a major race do you need to exercise Rosa at different times. Rosa will come with us most of the times. I do try and plan a route with water available in streams and rivers especially in the hot weather. If we’re heading on really rocky terrain or in a nature reserve Rosa will just take a rest and we’ll take her out before or after. 9. Does she get on well with other dogs/animals? What do you feed her? Does she have any favourite treats? She’s mainly ok with all dogs. Cats she dislikes!! 10. If you were to offer any advice to someone getting a dog like Rosa what would it be? GSP’s require lots and lots of exercise, so remember that they have lots of energy so need to be walked or ran a few times a day at least. 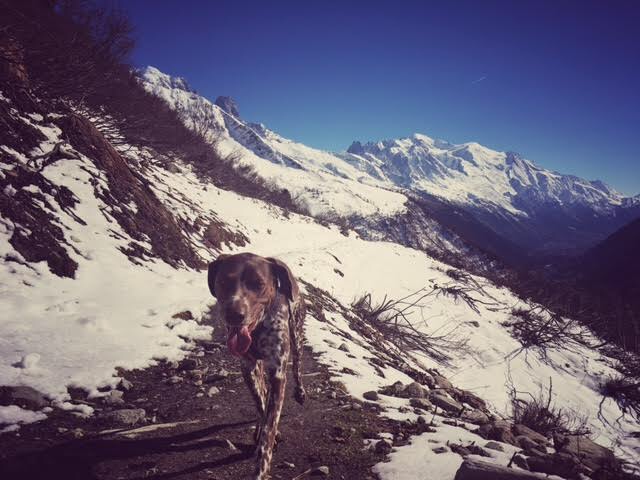 Rosa has adapted to our lifestyle so can run in the mountains all day! So that’s it folks a brief insight into the world of Rosa the wonder hound,it’s fair to say that Rosa leads a life that a lot of us might love to have and I’m sure we are all really jealous!There is some really good advice there from Natalie for looking after such an active dog. So a huge thank you from myself and Daisy the dog for taking the time to talk to us and interrupting your busy schedule. We hope this gives you a little insight into two super athletes and best friends! If you’d like to share your dog stories please ﻿ get in touch !